Micahel B. Knapp, President & CEO of New Way Hearing® is very please to be partnered with Audiologist, Dr. Jane Burns in San Marco, FL area. Dr. Burns, AuD. specializes in testing children and Balance Testing for our New Way Hearing® patients. Michael is an expert in testing as well, but he does not perform hearing tests and hearing aid recommendations on minors. He specializes in the testing, fitting and programming for a multitude of hearing aid manufacturers on adults. 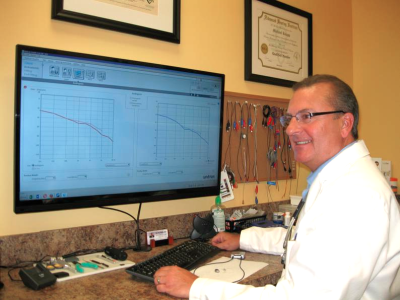 The ACA Audioprosthologist Certification he received in 2012 is the highest standard that a Licensed Hearing Aid Specialist can receive. In fact, only 3% of Specialists have this designated Certification nationally! Michael is also nationally Board Certified in Hearing Instrument Sciences. Please call us today to schedule a Free Consultation, or Hearing Test, to see the Audiologist or Audioprosthologist in the San Marco, Florida area. President & CEO of New Way Hearing Aids, Inc.
New Way Hearing® has two Hearing Clinics in the San Marco area. One at the eastend of Deerwood Park Blvd., just off JTB in the Availity Building, and the other in Orange Park on Park Ave. (US17) in the same center the Tax Collector Offices is located. Each of our offices offer a very unique experience in hearing healthcare. We treat every patient as a special individual to fit your personal needs. Please know, we are not just about fitting hearing aids. We are about comprehensive hearing rehabilitation. Effective communication and interaction is the main goal for all our patients. Our Hearing Clinic near San Marco is multi-line, which deal direct with most of the top hearing aid manufacturers in the world. This means we can accommodate just about any hearing loss, lifestyle and budget, and we are also aligned with most insurances carriers. Plus, if you do need hearing aids, you won't find any better price and service in town. And we gaurantee that! Limited supply & time offer. **Able to perform on most patients, but not all. ***Depending on location and scheduling.